Airstream Ranch at Dead End? On March 14, 2008, Frank Bates went before the Hillsborough County Code Enforcement Board to plead his case for the preservation of Airstream Ranch. The collection of eight old Airstream trailers along I-4 east of Tampa, Florida, set on end in the ground like prehistoric megaliths, had drawn widespread attention since it was erected in January. The trailer array drew complaints from at least a few neighbors, and hadn’t gone through any official approval process by the county. 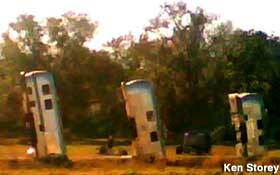 But the RV-Henge as was praised by many others as a work of roadside art. Bates gave what he described to us as “a beautiful presentation,” complete with endorsements from the president of the Ringling College of Art and Design, the dean of the University of South Florida College of Visual and Performing Arts, and even the director of the Arts Council of Hillsborough County. He also presented a petition signed by 4,000 supporters, and letters of endorsement from experts in the field of roadside attractions. The Board voted against Frank Bates, 6-0. Bates now has until April 15 to tear down Airstream Ranch, or pay $100 a day in fines. Sections: Attraction News Comments Off on Airstream Ranch at Dead End?